The strength of ISTP’s community can be brought back to the many outstanding volunteers who give of their time and talent. Although these dedicated individuals are many, we’d like to recognize some special volunteers, who have proven to be passionate leaders within our community. Courtney B. + Shirley C.
Courtney B. (3rd from left) and Shirley C. (5th from left) with volunteers at the 2015 Confucius Day. Courtney B. and Shirley C. are sure to be seen at many of the events on both Cohn and Cowper Campuses as they are room parents for both Pre-K and 1st grade classes. They led the charge for Kermesse last year. They are also active volunteers for Moon Festival and Confucius Day. Despite spending much of their time at school, they still know how to have a good time! 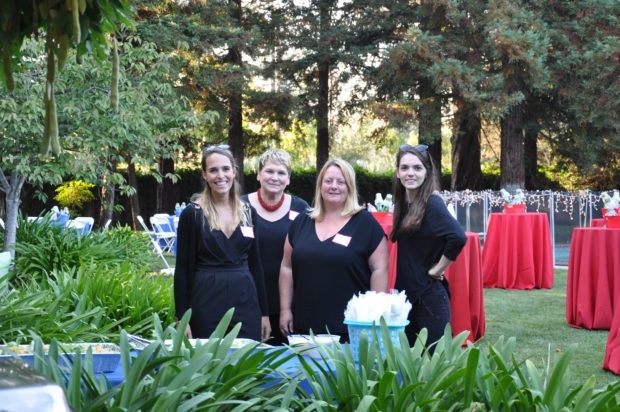 Last year at Gala, their table raised a remarkable $60,000 for the school! "Courtney and Shirley set up several family meet-ups during the summer before school. It made for a far less daunting launch into ISTP!" 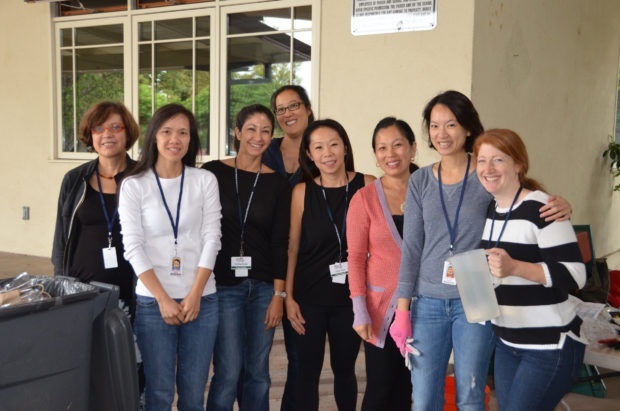 "They are really organized, helpful, thoughtful, and nurturing individuals. Perfect qualities for volunteering. They make it look so easy that I thought, I can do this too! Keeping the communication flowing, events running smoothly, and doing it all with a positive attitude - I think that is really inspiring for all parents to see." "To make dozens of strangers feel truly supported and welcomed really speaks to their incredible warmth and generosity of spirit." "Courtney and Shirley are tireless in their efforts to engage and energize the parent community. They manage to take on massive projects and loop people in without making it feel like an obligation: making it fun to volunteer and an absolute delight to work together to create something positive for our children and our school. To me, they are as much a part of our ISTP experience as the teachers and the annual events and we are all better off having them in our lives." Leslie D. (3rd from left) with volunteers at the 2016 Red Carpet. Leslie D. is a former recipient of the Mindy Williams Lifetime Volunteer Achievement Award. She sees an event from start to completion and goes above and beyond what is expected. Leslie has donated her Brittany, France, house several times to our auctions, chaired the food portion of Arts Night, and took on the roles of Room Parent Coordinator and Red Carpet Chair. She is always willing to help with new parents and meeting and welcoming new families. "Leslie has been such a knowledgeable resource when it comes to all things involving room parents and school events - she's my go to person to ask when I'm not sure about something that is happening, and she always has the answer, or can figure it out quickly." "As a parent when I work with Leslie I trust that the result will be great. Her sense of commitment, her organization skills, and the amount of time and effort she puts make her who she is." "Leslie takes on the most challenging volunteer tasks and her dedication and high standards improve the quality of everything she is involved in. It takes a special kind of volunteer to handle the challenges of costuming kids for a class performance, and Leslie has taken it on year after year." "Leslie has been a model to me of how to volunteer to support her children and the school, but also to forge the bonds of community. She has demonstrated how the total benefits of volunteering are greater than the personal costs of finding the time to do it. She has shown my family how to be involved without being intrusive: Leslie is a tireless volunteer who never calls attention to herself or her contributions. In a world of unrelenting self-promotion, Leslie is exemplary of an all too scarce altruism." Our volunteers make the commitment because they have standout leaders with visions that guide and rally the community. Thanks to leaders like Courtney, Shirley, Leslie, and many more, when you come to school, you feel good because things are running smoothly, and I can only hope that our students will emulate these qualities in the future.